Your guide to Grey Cup festivities. 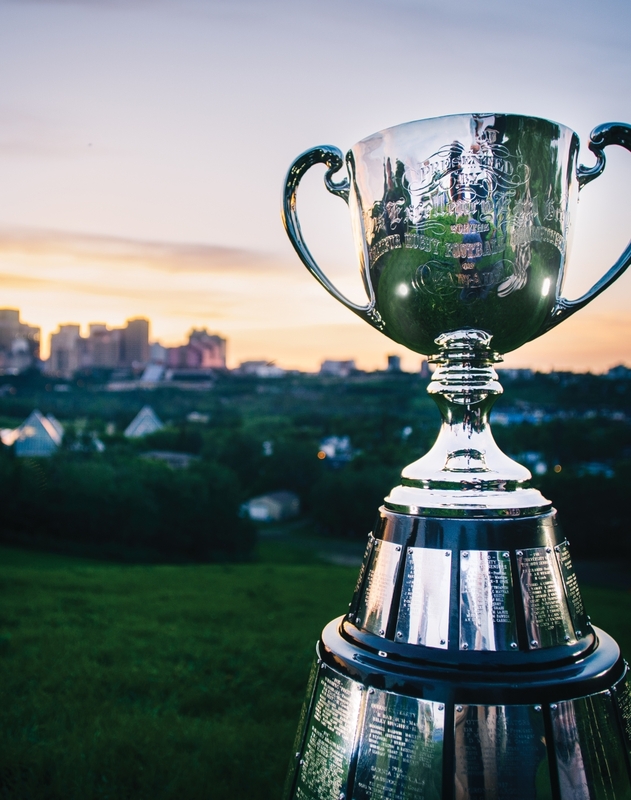 For five days in November, CFL fans from across the country will descend upon Edmonton to celebrate the Grey Cup, Canada’s largest sporting event. We Edmontonians have never been ones to turn down a party, meaning you needn’t stay holed up at home. Here’s your guide to what’s what, who’s who and how you can join in. Should I wear green and gold? Before you head out the door wearing your green and gold Esks jersey, remember that the Grey Cup Festival is the ultimate celebration of Canada. It’s even more Canadian than the Canada Day pancake breakfast at the Leg. The festival is not just about the two CFL teams battling head-to-head in the final. Expect streets, bars and party rooms to be filled with fans dressed in team jerseys from all across the league and costumes that will make you think it’s Halloween all over again. The BC Booze Brothers need no introduction. 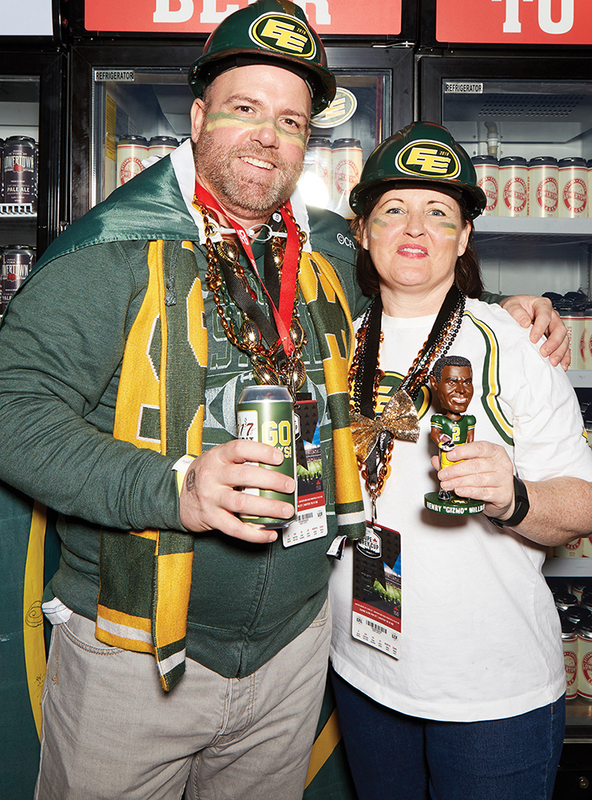 The 50-plus members have been staples at Grey Cup Festival hospitality rooms since the early ’80s. 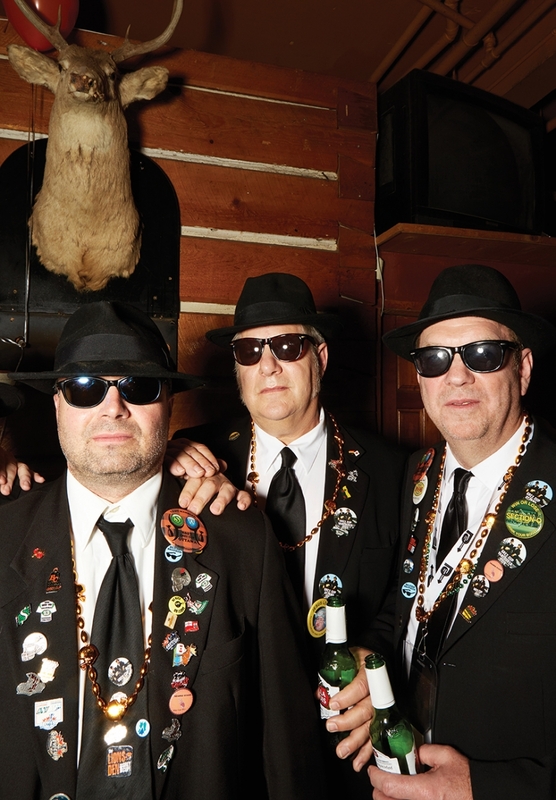 Dressed in black suits, fedoras and dark sunglasses, these Lions fans take their look and name from the cult-classic movie, The Blues Brothers, that starred comedians Dan Aykroyd and John Belushi. Expect the same riotous shenanigans and dance moves that made the Blues Brothers the essence of cool. Ottawa’s most celebrated lumberjack, Big Joe Mufferaw, has been inspiring generations since the 1800s. Stompin’ Tom Connors penned a song about Big Joe that recounts tales of him putting out a forest fire with five spitballs and riding on the back of his pet bullfrog. Most recently, the larger-than-life folk hero was the inspiration for the Ottawa Redblacks’ mascot, Lumber Joe. He served as the muse for Ken Lancastle and Jon Cheff when they were looking for a creative way to cheer on the CFL’s newest team. 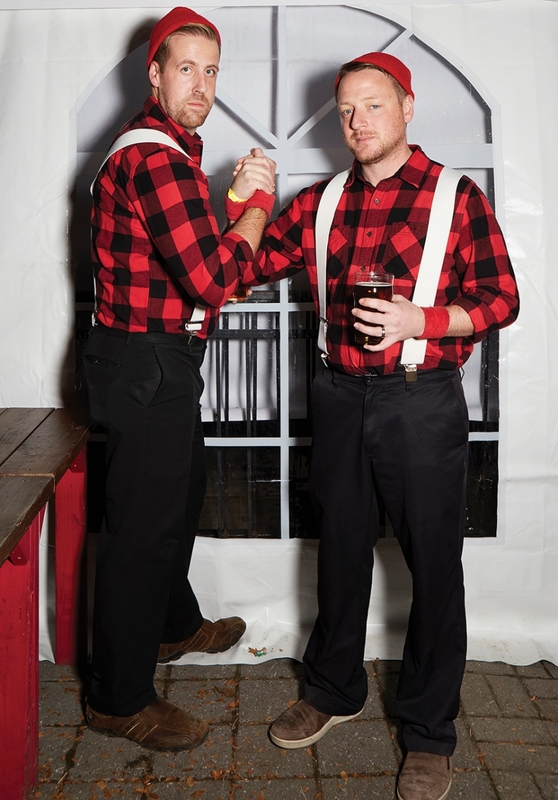 In their plaid lumber jackets, white suspenders and red tuques, the Lumber Joes have got the logger look down. 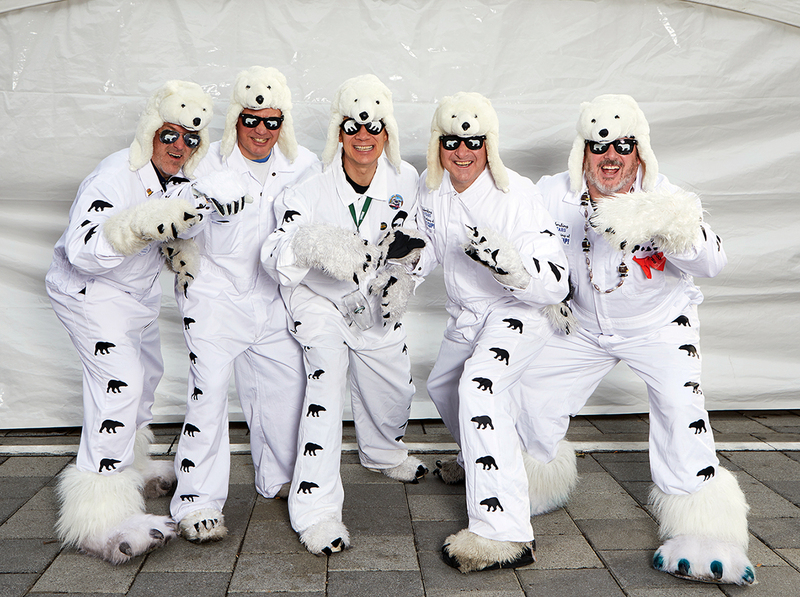 Since 1996, this group has attended every Grey Cup dressed as polar bears. They initially donned the kitschy costumes to protest the expansion of the CFL to the United States and to demand a football team for Canada’s north (yes, there were CFL teams in seven American cities in the mid-’90s.) But now the furry costume is more fun than protest. Polar bear Mark Sproxton says letters to the league were never answered, but the bears won a small victory spring 2016 when the league announced that the 2020 Grey Cup would be held in the Arctic. Too bad it was an April Fool’s joke. Never had a run-in with the law before? Well, now’s your chance. 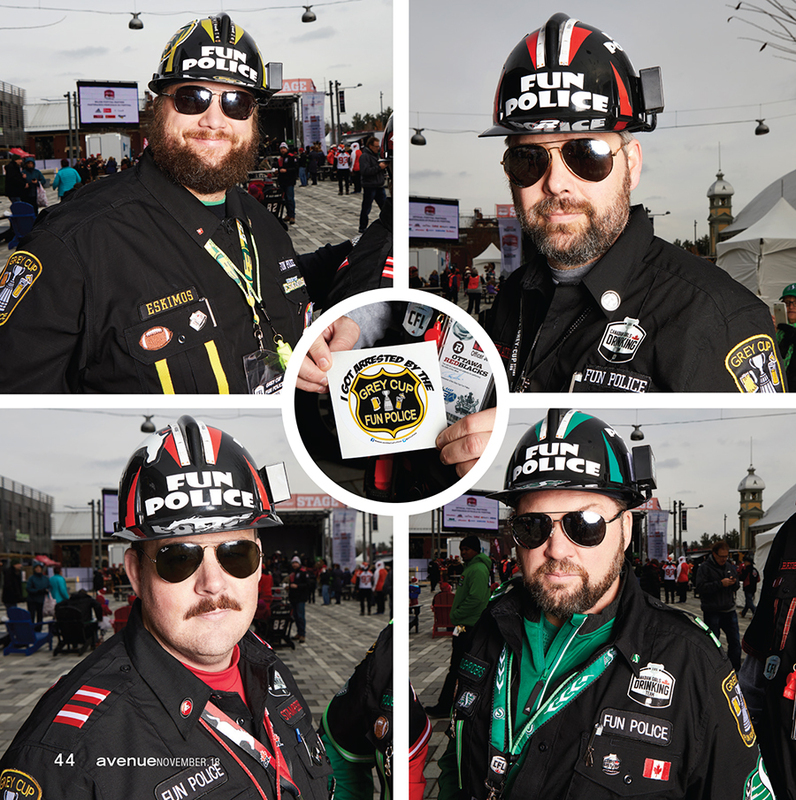 Since 2011, the Grey Cup Fun Police have been patrolling streets and hospitality rooms, ensuring that party patrons are having a whole lotta fun. Cavort about the dance floor and drink as much lager as you want around these officers. Over five days, Corey, Dave, Jeff and Kirk hand out about 10,000 tickets for party violations that include spilling beer, cheering for the wrong team and wearing non-CFL apparel. Each officer supports a different CFL team, which is good to know if you’re hoping to talk your way out of a ticket. Corey’s a Stamps fan. Dave cheers for Saskatchewan. Jeff and Kirk, the newest members of the force, holler for Edmonton and Ottawa. 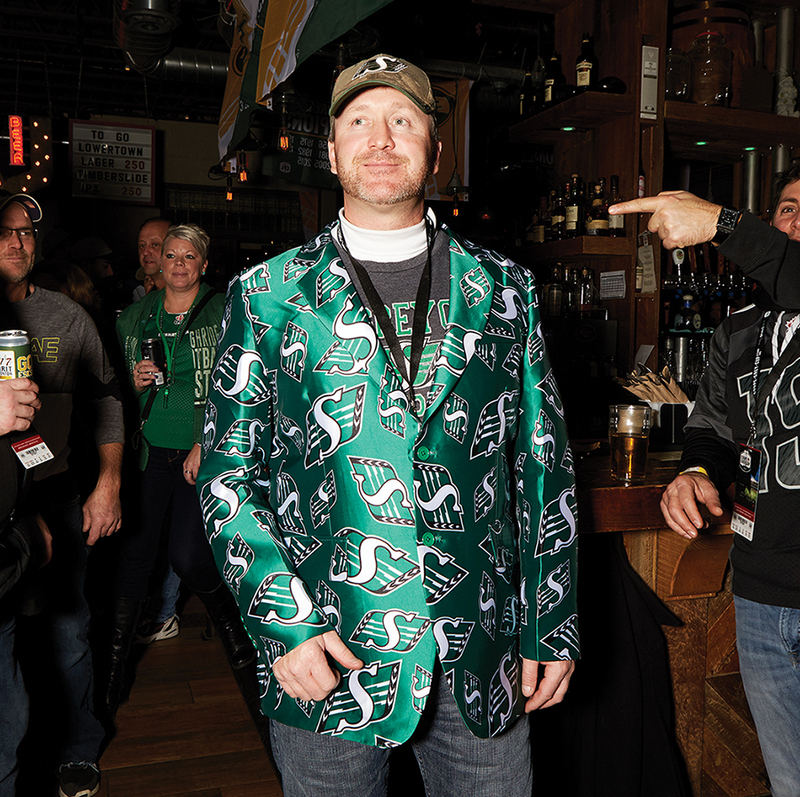 How Saskatchewan came to have the loudest, proudest and most loyal fan base in the CFL baffles most. Maybe it’s because the prairie province of just over one million people is a perpetual underdog? Proof: The Saskatchewan Roughriders have only won the Grey Cup four times in their 108-year history. But despite their less-than-stellar history, Rider Nation is pure fandemonium. From hollowed watermelon helmets to green face paint to those hideously loud vuvuzela horns, Saskatchewan fans are having a blast. The Americans are here! The Americans are here! Nearly 25 years after the CFL made the disastrous decision to expand the league to U.S. markets, Baltimore Stallions fans still head north annually to celebrate their team’s 1995 Grey Cup win. Despite their small numbers, it’s hard not to miss their stately presence. 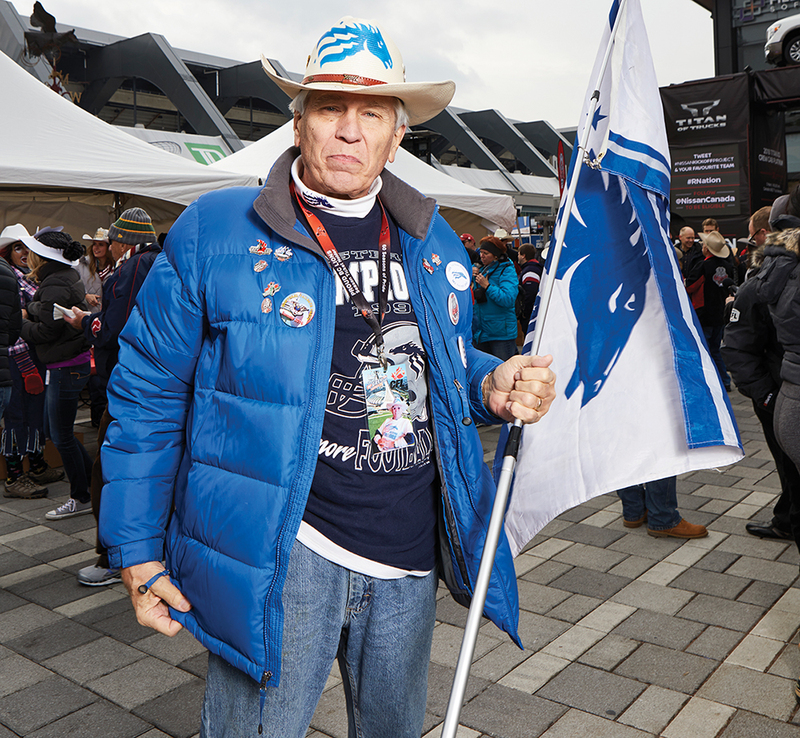 Look for the towering flag-waving Leo Dodge in his blue puff jacket at most official Grey Cup shindigs. A horse walks into a bar. No really, it happens every year at Grey Cup. It’s been a tradition since 1948, when Stamps fans hopped on a train heading to Toronto with horses, wagons and a western band. The raucous group rode their horse through the Royal York hotel and the Calgary Grey Cup Committee has been reenacting this horseplay every year in the host city. Regulars at Commonwealth Stadium know that there’s one corner of the building where passionate fans throw themselves into the game. Take a seat in Section O and meet Section O, one of Edmonton’s most recognizable (and noisiest) fan groups. 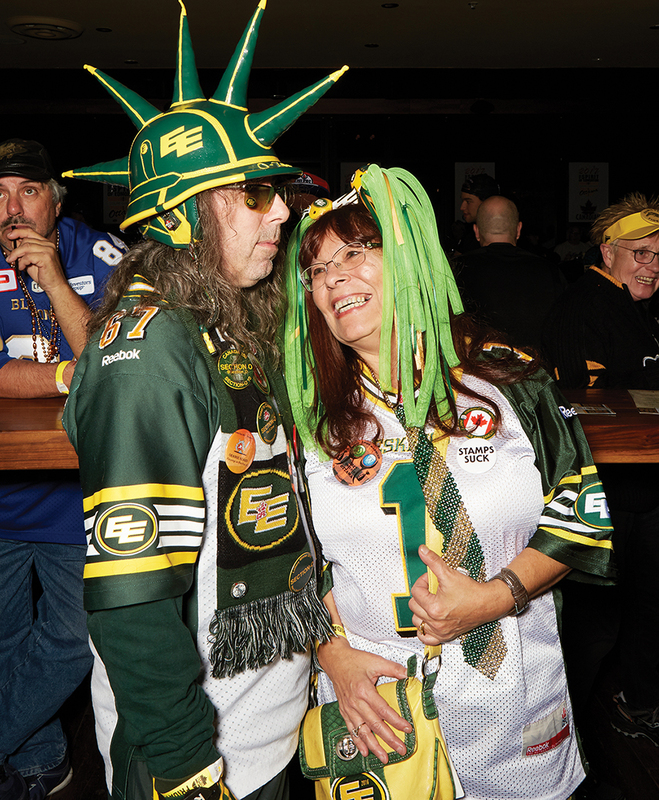 Started almost 15 years ago by brothers Peter and Matt Machado, and friend Jay Ferguson, the now 60 strong Esks fans are known for wearing helmets plastered with stickers, yellow shorts, green knee socks, Hawaiian leis and whatever green and gold wardrobe accessories they can get their hands on. If you’re going to revel with these loyal superfans, get used to a hoarse voice. Section O has chants for every imaginable football move, from a touchdown to a penalty call. During Grey Cup, their battle cry becomes a more “sociable” cheer. On the eve of the 1972 game between Hamilton and Saskatchewan, Lorne Greene of Bonanza fame announced that 22-year-old Maria Gulyas of Winnipeg was crowned Miss Grey Cup. 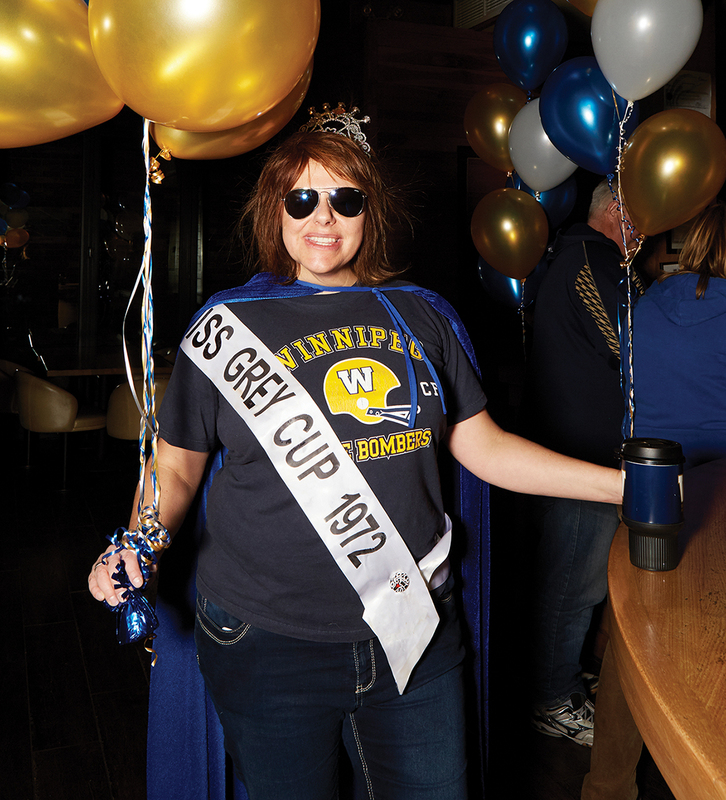 The annual beauty pageant was one of the most anticipated Grey Cup events, attended by politicians, celebrities and legendary football players. By 1988, feminist views around the objectification of women put an end to the contest. However, every year, Kim Pohl keeps the tradition alive and struts her stuff at the festival wearing a sparkling tiara, blue velvet cape and sash. 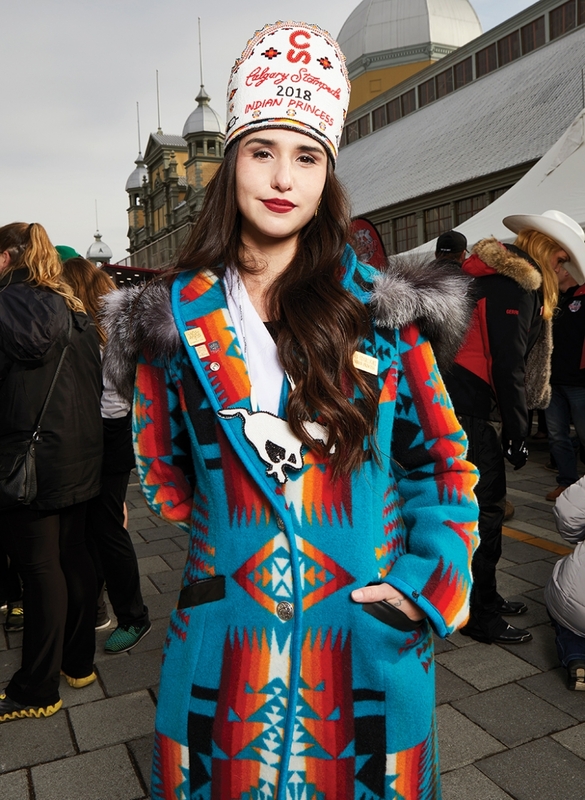 Every year since 1948, the Calgary Grey Cup Committee has been flipping pancakes at the festival, giving fans a taste of western hospitality. Friday and Saturday morning, head to the Nissan Titan Street Festival on Jasper Avenue for free pancakes and beef patties hot off the grill. 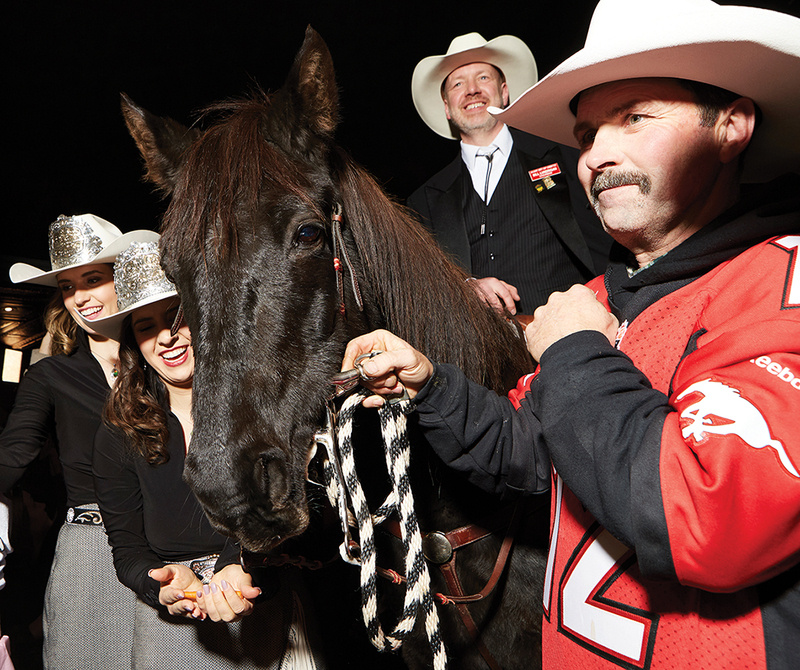 Appearances by the Calgary Stampede Queen and Princesses, the Stampeders cheer team, mascot Charlie Horse and house band High Steppin’ Daddy keep the party energized. Yahoo! Snap up a lobster roll at the always-popular Atlantic Schooners party. The lobster is flown in fresh the day before and a dedicated team of volunteers prep all afternoon. Huge chunks of claw, tail and knuckle meat are mixed with a dollop of mayo and sandwiched between a buttery bun. Like any good kitchen party, there’s fiddle music, dancing and lifelong friends to be made. What goes into this alcoholic drink served at the Spirit of Edmonton Breakfast is one of the Grey Cup’s best kept secrets. Some say it’s orange juice, vodka, perhaps Cointreau, Grand Marnier or Cognac. It’s served by the pitcher until all 750 litres of juice are gone. Don’t worry about drinking early in the day, there’s a breakfast buffet to soak up the booze. This year, due to demand, a second breakfast has been announced for Friday morning.